Safe sun creams for a carefree summer! As I promised you in my previous post, I’ve tried my best to provide you more practical informations about sun creams and which ones I recommend you this summer. As we already know, the sun light is very important for our health, though is not good to exaggerate with the sun exposure, especially if we aren’t used to go out on the sun the most part of the year. Too much sun exposure can cause damage on the skin and cells. In every case we need a really good and safe sunscreen to protect our skin. Many proofs and scientific results regarding the harmful properties of conventional chemical sun creams are emerging out more and more. Furthermore, recent discoveries result that skin cancer is strongly related with toxic chemical ingredients in conventional sunscreens. Many people have already discovered by themselves that high chemical SPF factors can cause many skin diseases instead of really protecting the skin. This is especially a problem when high SPF with toxic chemicals are applied on your child’s delicate and sensitive young skin. I want to share with you a real story regarding chemical sunscreens that happened in my family a few years ago . My grandfather had a small wound and a bacteria infection on his ear (outside, on the skin). After some simple cures in the beginning, the situation has improved, the skin was becoming healthy. Since the doctors needed to check his state regularly, one day in the beginning of the summer, the doctor prescribed(!) him to start using a very well-known brand of chemical sunscreen with the SPF 60! When he told us about this, we were surprised. We knew that he doesn’t need it, since he never went out on the sun. But he is the type of person who obeys the doctors and he decided that he would use the prescribed sunscreen, even though there was no need, since the wound on his ear was going better and better. Guess what happened? The wound was small, but it started to getting worse and worse after applying that sunscreen. That occasion made me start to reflect even more about toxic chemicals and the pharmaceutical industry selling us drugs without curing us. The conclusion of the story is even worse: the state of my grandfather’s ear got so worse, that they started to apply him many other drugs and creams on and on. Today he is without his ear. But this is the beginning of another story. Apart these two minerals, a high quality sunscreen has to contain also some herbal and plant extracts to soothe the skin with its antioxidant, anti-inflammatory and calming effects. Among plants with an excellent function in a sunscreen, there are: aloe vera, shea butter, jojoba oil,… They don’t oxidize on the sun and they provide a lot of benefits for our skin. PABA (para-aminobenzoic acid): causes allergic dermatitis, photosensitivity, produces free radicals that cause mutations, lead to cell death, may be implicated in cardiovascular diseases, causes changes in blood components. Octocrylene = UVB filter: it is absorbed into the nucleated epidermal layers, can cause skin irritation and contact dermatitis. Camphor derivatives(4-methylbenzylidene or 4-MBC) = UVB filters: endocrine disruptor, lead to hypothyroidism, can cause photoallergic dermatitis, bioaccumulative in the environment. Which sun creams are safe and good for the skin? 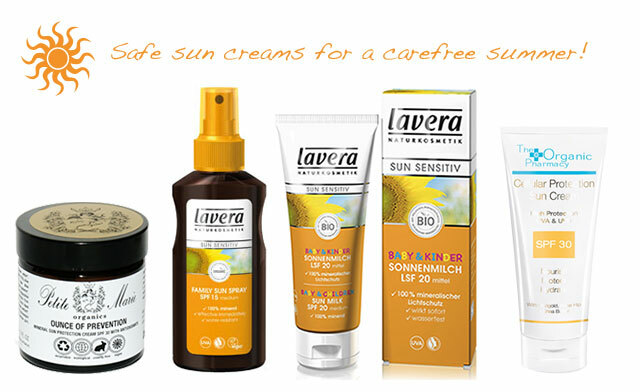 Lavera Baby & Children Sun Screen SPF 20 contains precious organic ingredients such as beeswax, canola oil, shea butter, organic carotene and organic sunflower oil. This lotion is suitable even for the delicate baby skin. Due to its precious oils and plant extracts it protects the skin from moisture loss and the skin cells from damage. Another very good brand is Petite Marie Organics from the above mentioned Julie Gabriel, with a totally safe product named Ounce of prevention. This is a mineral based sun cream with SPF 30+ with zinc and anti aging antioxidants like green tea, lycopene and precious oils like argan, starflower and black currant oils. The Organic pharmacy has also a collection of sunscreens on a zinc oxide basis. They contain many natural beneficial ingredients like sweet almond, sweet orange, rose hip, honeysuckle, aloe vera and shea butter. Green makeup tip: Don’t forget to protect even your lips with a lip balm with a SPF. Lavera has an excellent one! Truly safe sunscreens contain only herbal ingredients and mineral filters that do NOT include nano particles. A safe sunscreen has to protect the skin in a safe way, without irritating it. 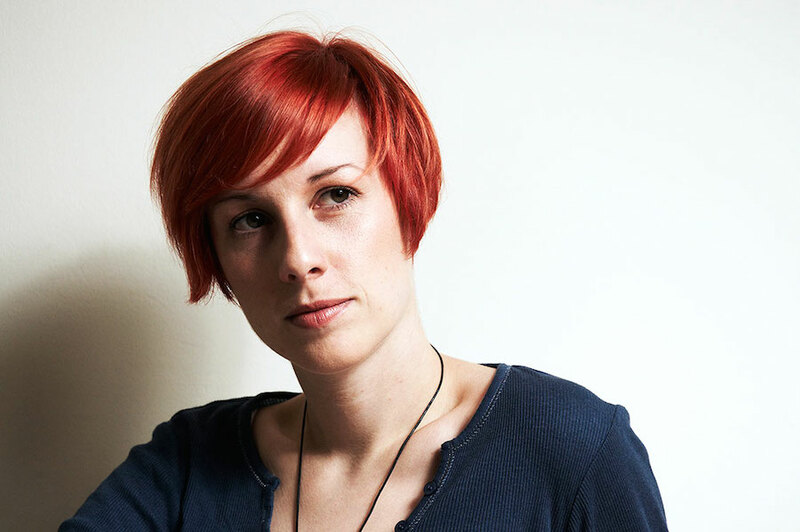 Independent certifications such as Ecocert, Cosmebio (Cosmetique Bio), Soil Association, BDIH, Natrue,etc. forbid the use of nano particles and toxic chemicals and guarantee us more security than just a normal pretty advertising in the magazines. Though, for me the most important thing is still to read the labels with ingredients. Enjoy your summer sunny days! « Is the sun really our enemy? 0 comment on Safe sun creams for a carefree summer! I read your comments on Fig+Sage’s post about nanoparticles and I was so glad you voiced your opinion. I completely agreed with you. I think nano sized materials in personal care products are a huge concern, and I was disappointed to see a popular beauty blog telling its readers that they are probably okay. I encountered that topic “casually” and I was really surprised. I know that is very hard for all of us to discover the truth about nano materials(if a company is safe or not). But since these things aren’t researched enough, no one can claim that are 100% sure, especially people who sells products are problematic, because their care is just to sell.